It’s a good day! After endless hours of work, we finally have another product ready for Waterdeep: Dragon Heist. This time it’s the Xanathar’s Lair – and, more specifically, DM’s resources, maps and aid for staging a heist on the mad beholder’s lair! Heisting Xanathar’s Lair is available on the DM’s Guild as a standalone product, but has also been added to our Complete DM’s Bundle for Waterdeep: Dragon Heist. 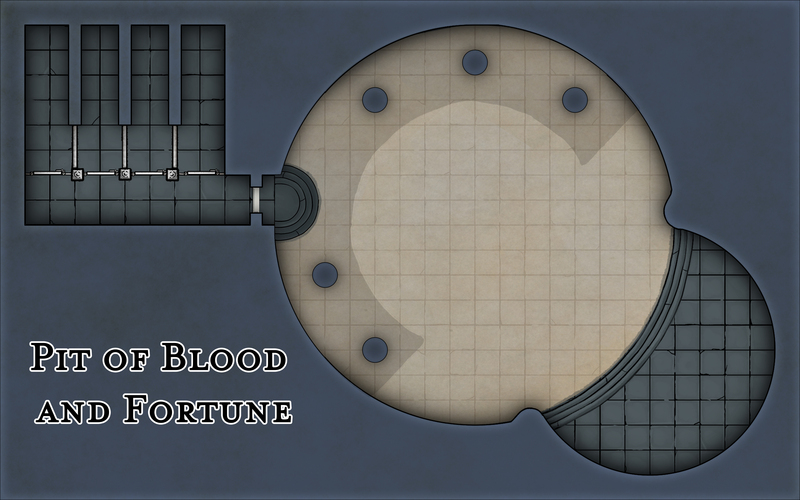 To celebrate, we have a free, high quality battlemap for you: the Pit of Blood and Fortune in Xanathar’s Lair. The arena is a nice addition to Xanathar’s Lair, and might come in handy if your party signs up for the gladiatorial contest. As always, the battlemap is primed for digital tabletops. You’ll get a full map of Xanathar’s Lair when you purchase Heisting Xanathar’s Lair (which, at 80×100 inches was a real pain to make, I must say! ).